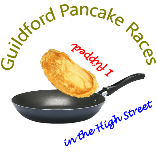 The Races will be held on Shrove Tuesday (17th Feb.) The exact format is difficult to determine this year as it’s half term week and schools will not be taking part. The following is a guide only and will be updated frequently. Please check this page regularly before committing to enter a race etc. The Friary Centre will be sponsoring the Children’s races and have offered 1st, 2nd and 3rd prizes for each! They have announced the characters from the Mad Hatters Tea Party that will be taking part in the Mascot Relay; The Cheshire Cat and the Rabbit! All Open Relay Places have now be taken so we will not be able to take anymore entrants into these races for both Health and Safety reasons as well as restrictions on our Event Insurance. If you are an Estate Agent or Solicitor though, the good news is there is still some availability in these two events. We have had a pretty poor turn out from the Games Companies with only EA Games and Lionhead Studios brave enough to come to town and take each other on. Turbulenz and Media Molecule - ARE YOU IN HIDING - 01483 598420? Unusually we have had a poor turn out on prize givers this so many of you will just have to take part for the fun of it and the possibility of winning a Creme Egg as a 2nd Prize! The weather forecast is for full sun on Tuesday morning and a sizzling 6 degrees! It’ll just be the mascots complaining then.